As one of the world’s most popular Instagram models, Tammy Hembrow is no stranger to trolls. And on Monday, the fitness queen hit back at a follower who said she looked ‘bloated’ while attending a Bondi Sands party at Coachella over the weekend. 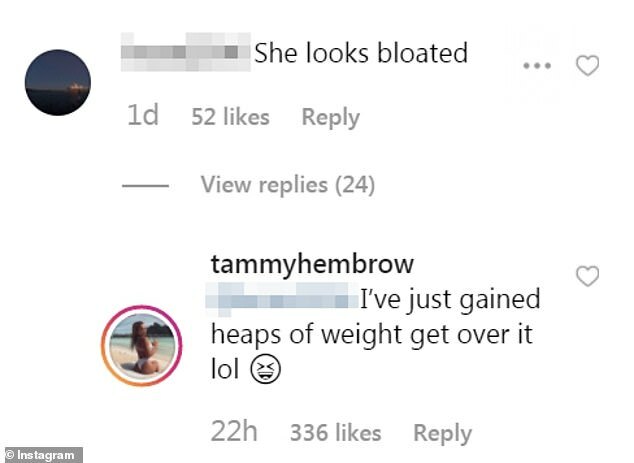 ‘She looks bloated’, the troll commented below photos of Tammy posing outside the VIP event. Instead of ignoring the hurtful remark, the Saski Collection founder responded: ‘I’ve just gained heaps of weight get over it lol’. It’s possible that Tammy hasn’t been exercising as much lately because she is recovering from an injury. A video recently emerged on an Instagram fan account, in which a friend of Tammy’s can be heard saying she has a ‘broken’ ankle. ‘Tammy’s literally got a broken ankle, so she’s going to Coachella on crutches!’ the female friend said off-camera. While Tammy wasn’t using crutches in the footage, she nevertheless seemed to be in pain and limping from side to side. Over the past five years, the activewear entrepreneur has become an online sensation thanks to her dramatic body transformation and ‘clean eating’ lifestyle.